Wednesday's episode of Supernatural was so great it took me two days to process all my feelings of abandonment when it was over. At last I was able to work through some of my issues, just like Dean, and tackle this recap. First of all, oh hey, Kevin and his badass mom are back! Kevin managed to write down a recipe for demon-killing bombs from the tablet before Crowley snatched it away, and his mom hooked up with a witch on Craigslist who promised to help get ingredients for some. For a price. There are some pretty funny scenes where Kevin and his mom are bargaining with the witch on videochat, and it's pretty obvious she's up to no good. Witches! What can you do. Meanwhile, Crowley has been torturing that nice angel that worked at a fast food joint trying to get the names of all the other potential prophets out there. I guess it's sort of a vampire slayer deal, where there are a bunch of potential prophets but they are only activated when the current prophet dies. Once Crowley has all the names, he starts collecting them as insurance. If Kevin won't cooperate with him, he's got backup. I love the bit when the kidnaped potentials ask Crowley if he's an alien and they're on a spaceship. Because think about it! Would you be more likely to guess Hell or spaceship if somebody teleported you to a magically glowing room? Pretty soon Kevin joins everybody in the Hellship because that skanky witch turned him over to Crowley. Apparently she didn't like what Kevin's mom was going to pay for those demon bombs so she went to the old King of Hell. As Sam says to Kevin's mom when she calls them up frantically for help, working with witches isn't really a good idea. Especially the ones you find on Craigslist. At least go through Pagan Friend Finder or something. It's time for a flashback to Pugatory! Dean keeps hallucinating that he's seeing Cas everywhere, and he's dwelling pretty intensely on his last day in Purgatory — the day that he abandoned Cas when he couldn't pull the angel through the portal with him and Arm Pimple Bennie. Yes, he ABANDONED Cas. Just the way he abandons everybody, and the way Sam abandoned him, and the way Sam abandoned his girlfriend and dog. Basically it's the all-abandonment episode, just like last week and the week before. Luckily, Cas pops up for real just in time to set Dean straight and hopefully stop all our obsessing over who abandoned whom and when and what daddy issues have been triggered. He claims not to remember very much of what happened, and he has no idea how he got back to Earth. He was in Purgatory, and then suddenly he was walking by the side of the road. I immediately suspected God, but the answer turns out to be a lot cooler and more intriguing. Also, Cas has a total showdown with Crowley where he goes all fiery angel on him, smashes the tablet (now Crowley only has half of it), and rescues Kevin. Nicely done. I'm glad we have righteous Cas back. 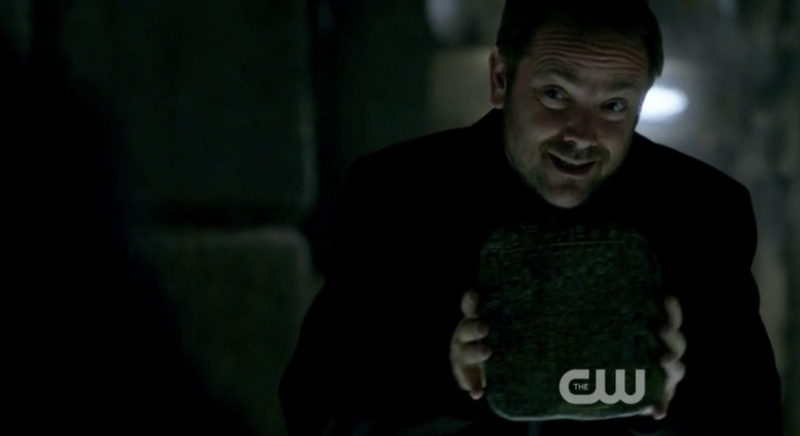 Also, I like having the more angry, torture-loving Crowley back too. He's definitely working the "yes I am really evil" angle and that makes good sense for this season. There's only so long you can have a sympathetic demon. At any rate, Kevin is definitely worse for wear. Crowley tortured him and cut off his finger, while also forcing him to watch while he killed some of the potentials. The tablet definitely contains some great ways to fight demons, as well as the rules for how to shut the gates of Hell (again, for those of you who were with us in earlier seasons). We also find out that it is just one of many tablets written by the angel Metatron. So this leaves us with two simple season arcs: Get the half tablet back, and try to get those other tablets too. By far the most interesting parts of this episode came at the end, when Cas showed Dean what really happened the day he escaped from Purgatory. Though Dean remembered Cas trying to escape but losing his grip on Dean's arm and slipping away, it wasn't really like that. Cas actually let go of Dean's arm and chose to stay because, as he put it, "I needed to atone." That's a fantastic move for the show to make — yes, Cas DID need to atone after doing all that damage and turning into Angel Hitler. I also liked the fact that the show was taking moral issues seriously again, instead of just giving us more monster stuff. This show has historically been at its best when mixing fun action with real spiritual questions, and Cas' comments on atonement made me remember when Supernatural was dealing with weightier questions. We also met a new Big Good — a woman in a glowing white room named Naomi who seems to have Godlike powers. She snatched Cas out of Purgatory, with the help of many angels. When he suddenly arrives in her office, right in the middle of talking with Dean and Sam, she forces him to tell her everything that's happening with the tablet. She tells him that he will be reporting in to her regularly, but will never remember any of it. Who is this interesting new Heavenly force? I am intrigued.